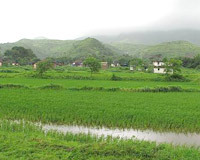 Lonavala is one of the favorite hill stations of people of Mumbai and other nearby areas. Come weekends and you can see most of the stressed out Mumbaiites coming here to take a break and rejuvenate themselves. What makes this hill station so special is the fact that it has a very hospitable weather almost throughout the year and is definitely a welcome change from the concrete jungle. Blessed with a climate that would put tropical paradises to shame, Lonavala is the ideal place where beauty, serenity and fun mix up together to give you a vacation that you won't forget for a lifetime. To know more information on Lonavala weather and climate, just read on. Summers in Lonavala are very pleasant. The maximum temperature remains around 30-35 deg Celsius. Occasional showers and the evening breeze helps cool down the temperature and make it very pleasant. You can carry light cotton clothes if you are traveling here in summers. The monsoons turn this hill-station into a magical paradise! In fact, all those who have a penchant for traveling, come here during monsoons and swear by the magic and beauty. The black clouds and smell of rain in the air is enough to heighten your senses and give you a thrill of getting drenched in the rain like never before. Temperatures drop down during winters, but the weather remains cool, not cold. Light woolens should suffice if you are traveling here after October. The average temperature during this time remains around 15 deg C.
Though Lonavala can be visited any time throughout the year, the best time considered for visiting this serene hill-station is from October to March. Do not miss waking up early morning and popping your head out of the window. The feeling of the morning mist softly kissing your cheek is an experience you wouldn't want to miss!